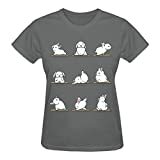 Bunnies Yoga is a cozy ring spun cotton t-shirt designed for Joe Hump. Pick up this tee and support one of our global artists today. This entry was posted in Wedding Store and tagged Bunnies, Grey, Neck, tshirts, Womens, Yoga by Formal Affair. Bookmark the permalink.